OH YOU BEAUTIFUL BEAUTIFUL BOOK LET ME HUG YOU FOREVER. It starts and it’s super cute. A young girl named Nimona shows up at Lord Ballister Blackheart’s Supervillain HQ to inform him that she is his new sidekick. At first he is taken aback, because he doesn’t want a kid following him around but then Nimona is all like “I am not a kid, I am a SHARK”, shapeshifting in front of his eyes and all of a sudden… the possibilities are endless. Like I said, super cute, right? This set-up right there is everything you need to know about the characters, the story and the subversion that is going on: nothing is what it seems, and this is especially true when it comes to Nimona herself. Because just then at the end of their first adventure together, Nimona shapeshifts into a small adorable girl and stabs someone in their back. That’s when I realised I was reading something AWESOME. Something that shows that comedy, cuteness and charm do not mean superficial, thoughtless or graceless. Because Nimona is not what I expected. Because the story does not go the way I thought. And THEN when I least expected something happens that at first is easy brush off like it’s nothing but it’s actually one of those arrows that pierces your heart and LEAVES YOU BLEEDING INSIDE. Blackheart might be following the rules but he is probably the only one doing it. The subversion continues with good guys of the Institution of Law Enforcement and Heroics being shady as hell; its greatest hero, Goldenloin is kinda of a pathetic idiot recklessly following their orders. There is a backstory and super sour grapes between Goldenloin and Blackheart and it might be a lot more to it than simply a competition between heroes. 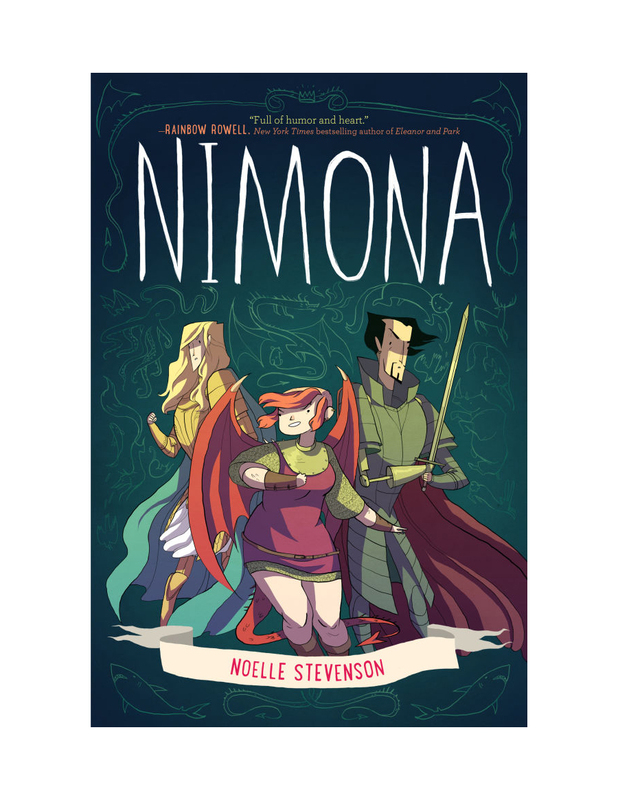 Originally a webcomic and now collected in a Graphic Novel, Nimona is Noelle Stevenson’s (one of Lumberjanes’ co-creators) fantastic epic story of Nimona, The Supervillain. It’s an origin story (but not how you expect it), it’s coming of age (but probably not of the youngest character), it’s reluctant villains AND heroes, it’s friendships and love. And it’s a look at how trauma can shape the way we look at ourselves and how we interact with others. It has humour. It has amazing art. It’s nerdy. It has subversion. It has Science Fiction and Fantasy. It has a character called GOLDENLOIN. A Faux medieval setting that might also be the future. It has a LGBT romance. It has heart. It has flair. It has Nimona. Who has my heart bleeding at her feet and this 10-rated review. I read the webcomic and at a certain point, while I felt like I was being stabbed in the heart, I remembered the beginning & how cute it was and marveled at Stevenson’s ability to move from one story to another without losing the substance of either. Ugh, I love it so much. 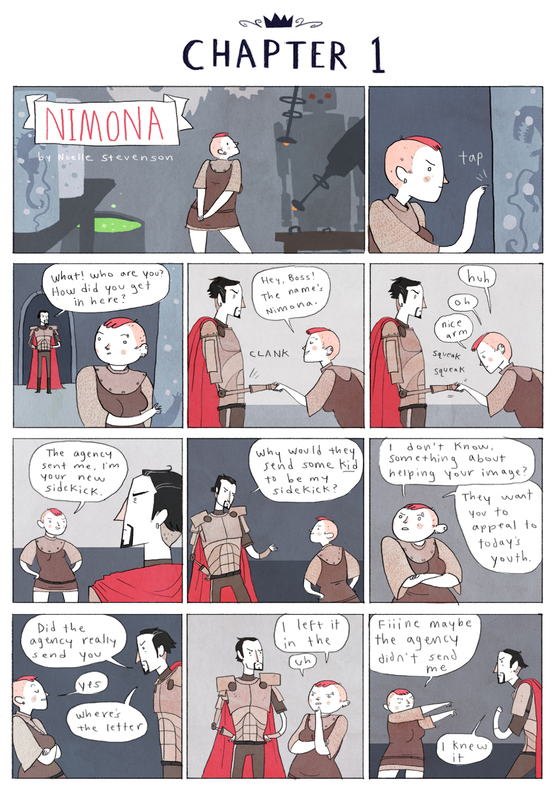 I love Nimona herself so much. Ooh, I have SO gotten into webcomics – MUST read this one now! Thanks! The webcomic destroooyyyed me with it’s amazingness. Really need to read the collection!